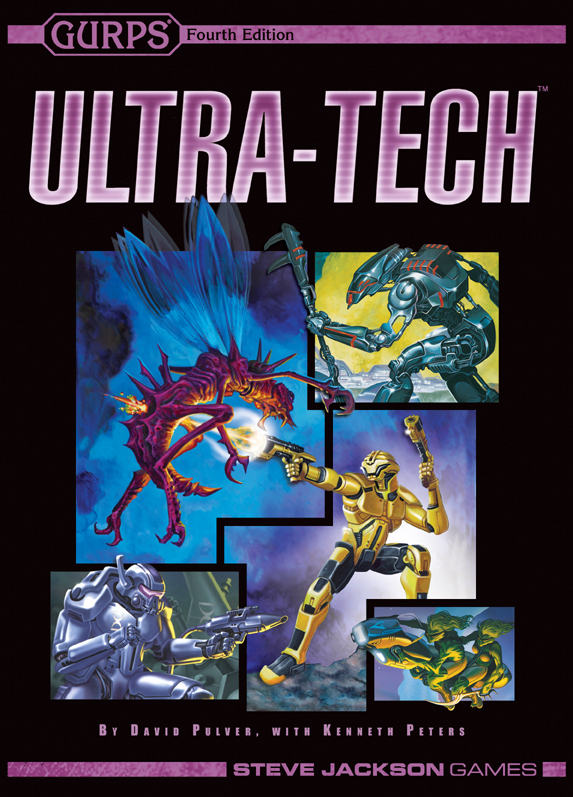 GURPS Ultra-Tech: Weapon Tables – 20 pages of just weapon tables, available in a single convenient PDF. GURPS Reign of Steel: Will to Live – This supplement includes an assortment of ready-made killer robots for the GURPS Reign of Steel setting, built as GURPS Fourth Edition characters. Pyramid #3/12: Tech and Toys – Featuring lots of new items and options in the Ultra-Tech vein. Pyramid #3/37: Tech and Toys II – Featuring a laser-weapon design system written by David L. Pulver, an assortment of new firearms and heavy weapons, and more! Pyramid #3/46: Weird Science – For impossible and strange equipment, plus optional systems to let you create them. Pyramid #3/55: Military Sci-Fi – A look at the equipment and logistics of futuristic fighting forces. Pyramid #3/85: Cutting Edge – New near-future tech and ideas, including a design system for futuristic armor from David L. Pulver!